The circular orifice in the center of the iris, through which the light rays enter the eye. Argyll Robertson pupil one that is miotic and responds to accommodative effort, but not to light. 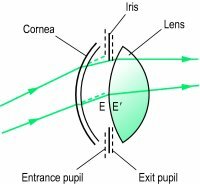 fixed pupil one that does not react either to light or on convergence, or in accommodation. tonic pupil a usually unilateral condition of the eye in which the affected pupil is larger than the other; responds to accommodation and convergence in a slow, delayed fashion; and reacts to light only after prolonged exposure to dark or light. The apparently black circular opening in the center of the iris of the eye, through which light passes to the retina. a circular opening in the iris of the eye, located slightly to the nasal side of the center of the iris. Like the iris, the pupil lies posterior to the cornea and the anterior chamber of the eye and is anterior to the lens. Its diameter changes with contraction and relaxation of the muscular fibers of the iris as the eye responds to changes in light, emotional states, and autonomic stimulation. The pupil is the window of the eye through which light passes to the lens and the retina. See also dilator pupillae, sphincter pupillae. pupillary, adj. The circular orifice in the center of the iris, through which light rays enter the eye. The circular opening in the centre of the iris of the eye. 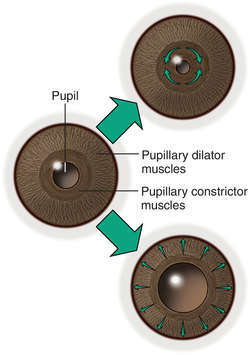 The pupil becomes smaller (constricts) in bright light and widens in dim light under the action, respectively of its circular and radial muscle fibres. the central opening in the iris of the vertebrate eye through which the light passes to the lens and retina. It changes in size as a result of muscle contraction and expansion moving the iris. The part of the eye that looks like a black circle in the center of the iris. It is actually an opening through which light passes. Aperture within the iris, normally circular, through which light penetrates into the eye. It is located slightly nasally to the centre of the iris. Its diameter can vary from about 2 to 8 mm. It is often slightly smaller in old age. The function of the pupil is to regulate the amount of light admitted into the eye, to optimize the depth of focus and to mitigate ocular aberrations. See acorea; anisocoria; corectopia; dicoria; dyscoria; hippus; iridectomy; microcoria; miosis; dilator pupillae muscle; sphincter pupillae muscle; mydriasis; Edinger-Westphal nucleus; polycoria; polyopia; pupil light reflex. Adie's pupil A pupil in which the reactions to light, direct or consensual, are almost abolished, with a reaction occurring only after prolonged exposure to light or dark. The reaction of the pupil to a near target is also delayed and slow. The condition is usually unilateral, with the affected pupil being the larger of the two (anisocoria). It may be due to a disease of, or injury to, the ciliary ganglion or to the short ciliary nerves. Other causes include temporal arteritis in elderly patients, syphilis or diabetes. Syn. myotonic pupil; pupillotonia; tonic pupil (some authors use this last term when the cause is known and Adie's pupil when the cause is unidentified). See efferent pupillary defect; Adie's syndrome; pupil light reflex. amaurotic pupil Miotic pupil that does not react to direct and consensual ipsilateral light stimulation, but does react consensually to contralateral stimulation. It is most often noted in cases of severe optic nerve dysfunction or retinal disease. apparent pupil See entrance pupil of the eye. Argyll Robertson pupil Pupil that reacts when the eye accommodates and converges but fails to react directly and consensually to light. The condition is bilateral, the pupils are small and usually unequal. It is usually a sign of neurosyphilis. See iridoplegia; tabes dorsalis. artificial pupil 1. Pupil made by iridectomy. 2. A circular aperture made in a diaphragm which can be mounted in front of the eye to provide a constant and smaller pupil size. It is used in research but also as a clinical test. See pinhole disc. pupil block See pupillary block. pupil constriction See miosis; pupil light reflex. pupil dilatation See mydriatic; pupil light reflex. entrance pupil of the eye This is the image of the iris aperture formed by the cornea. It is what one sees when one looks at an eye. It is some 13% larger than the real pupil and located slightly in front of it. Syn. apparent pupil (Fig. P23). exit pupil of the eye This is the image of the iris aperture formed by the crystalline lens. It is slightly larger (,3%) than the real pupil and situated slightly behind it (Fig. P23). Horner's pupil See syndrome, Horner's. Hutchinson's pupil A pupil that is dilated and completely inactive to all stimuli. It is associated with lesions of the central nervous system, as may occur in head injury. keyhole pupil A pupil shaped like a keyhole due to iridectomy in which a section of the iris extending from the pupillary margin to the periphery has been excised, or due to coloboma or trauma to the iris. pupil light reflex See pupil light reflex. Marcus Gunn pupil A defect of the pupillary reflex characterized by a smaller constriction of both pupils when the affected eye is stimulated by light as compared to that occurring when the normal eye is stimulated. 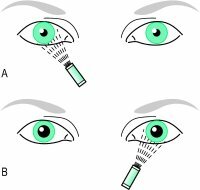 It is easier, however, to observe this phenomenon when swinging a light from one eye to the other in a darkened room while the subject is fixating a distant object (this is called the swinging flashlight test) (Fig. P24). Stimulation of the normal eye will cause constriction of both pupils whereas rapid stimulation of the affected eye will lead to a small dilatation (a paradoxical reaction, sometimes referred to as pupillary escape). This condition is due to a lesion in one retina or in one of the optic nerves, optic chiasma, optic tract, or the pretectal olivary nucleus that affects the afferent pupillary pathway. It is often the result of central or branch retinal or vein occlusion, extensive retinal detachment, retrobulbar optic neuritis, compressive optic neuropathy, or optic tract lesion, etc. Syn. relative afferent pupillary defect (RAPD), if the magnitude of the effect is partial; afferent pupillary defect (APD), if it is complete. myotonic pupil See Adie's pupil. pupil reflex See pupil reflex. tonic pupil See Adie's pupil. *To stimulation of the affected eye.†When caused by an aneurysm of the posterior communicating artery. Circular orifice in center of iris, through which light rays enter eye. At first the mothers of his pupils bought their daughters themselves to the studio; then they were satisfied to send them alone, after knowing the master's principles and the pains he took to deserve their confidence. It was the artist's intention to take no pupils but young ladies belonging to rich families of good position, in order to meet with no complaints as to the composition of his classes. He had carried his scrupulous precaution into the arrangements of the locality where his pupils studied. The girls of the aristocratic group of pupils belonged to the most devoted royalist families in Paris. Even in this temple of good intentions, an exceptionally sharp boy exceptionally determined to learn, could learn something, and, having learned it, could impart it much better than the teachers; as being more knowing than they, and not at the disadvantage in which they stood towards the shrewder pupils. But, even among school-buildings, school-teachers, and school- pupils, all according to pattern and all engendered in the light of the latest Gospel according to Monotony, the older pattern into which so many fortunes have been shaped for good and evil, comes out. Miss Peecher and Miss Peecher's pupils were not much encouraged in the unscholastic art of needlework, by Government. If some of my pupils chose to walk and take me with them, it was well for me; for otherwise my position in the carriage was to be crushed into the corner farthest from the open window, and with my back to the horses: a position which invariably made me sick; and if I were not actually obliged to leave the church in the middle of the service, my devotions were disturbed with a feeling of languor and sickliness, and the tormenting fear of its becoming worse: and a depressing headache was generally my companion throughout the day, which would otherwise have been one of welcome rest, and holy, calm enjoyment. I had all my meals in the schoolroom with my pupils, at such times as suited their fancy: sometimes they would ring for dinner before it was half cooked; sometimes they would keep it waiting on the table for above an hour, and then be out of humour because the potatoes were cold, and the gravy covered with cakes of solid fat; sometimes they would have tea at four; frequently, they would storm at the servants because it was not in precisely at five; and when these orders were obeyed, by way of encouragement to punctuality, they would keep it on the table till seven or eight. While receiving my instructions, or repeating what they had learned, they would lounge upon the sofa, lie on the rug, stretch, yawn, talk to each other, or look out of the window; whereas, I could not so much as stir the fire, or pick up the handkerchief I had dropped, without being rebuked for inattention by one of my pupils, or told that 'mamma would not like me to be so careless. My pupils will accept no such compromise as you propose. Ere long I had acquired as much facility in speaking French as set me at my ease with my pupils; and as I had encountered them on a right footing at the very beginning, and continued tenaciously to retain the advantage I had early gained, they never attempted mutiny, which circumstance, all who are in any degree acquainted with the ongoings of Belgian schools, and who know the relation in which professors and pupils too frequently stand towards each other in those establishments, will consider an important and uncommon one.